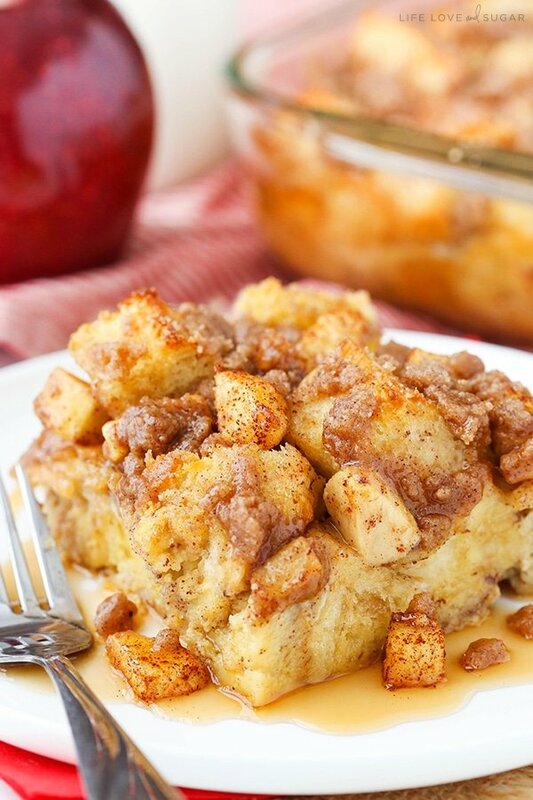 This Overnight Cinnamon Apple Baked French Toast Casserole is going to be perfect for the holidays and would be great for any time you want a fun breakfast without a ton of work or prep! The past few days, I’ve been spending time with some awesome bloggers in San Francisco. I’m home now, but I had a blast with everyone. It was a super relaxed trip. There was a general agenda of some fun things to do to explore the city but no pressure or strict schedule. I finally got to see the Golden Gate Bridge too! The last time I was in San Fran with the hubs, there was so much fog you’d have thought the bridge wasn’t real. This time we had amazing weather every day. And since Dorothy grew up there, she was the perfect guide! To give you an idea of the relaxed nature of the trip, one morning when I walked into the suite at the hotel that acted as our gathering space and “home base”, I asked if there was coffee creamer when I made coffee. The response I got was, “There’s Baileys!” Oh, how I love Lisa! 🙂 And I did have Baileys. I mean, that’s what vacation – and friends – are for, right? The weekend was full of just the right mix of blogging talk and relaxing with friends. 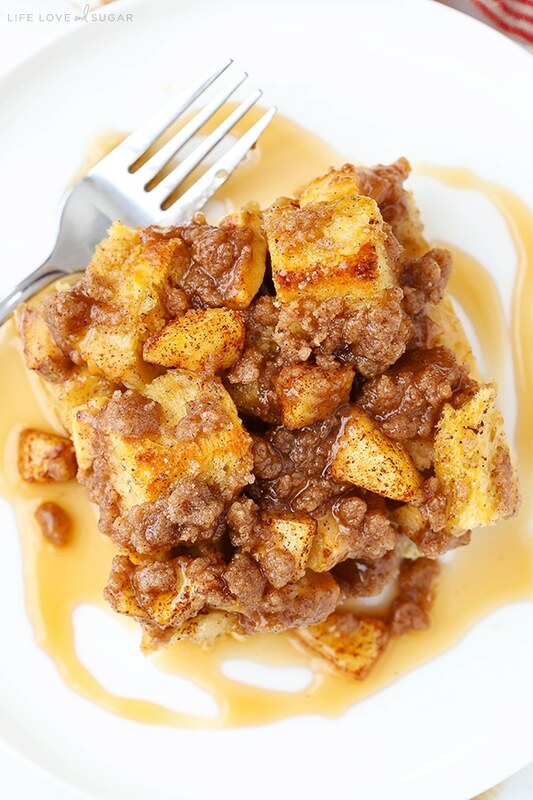 One of the great things about this french toast casserole is that because it’s so easy to prepare, you can totally enjoy time with your family rather than spend a bunch of time making breakfast. Particularly at the holidays, with so much going on and so much food being prepared, it allows you to get some prep work done ahead so you can spend the morning with your family. That’s how I like it. Not to mention that it’s cinnamon apple, which I love. Preparing the casserole is even quite easy and uses pretty standard ingredients, which I’m into. You’ll want a nice sized loaf of bread, about 1 pound. I personally am a big fan of sourdough bread in all things, so it’s what I use in this casserole. Feel free to use another kind of bread, but I wouldn’t suggest regular sandwich bread. That would be a little soft and wouldn’t bake quick as nicely. 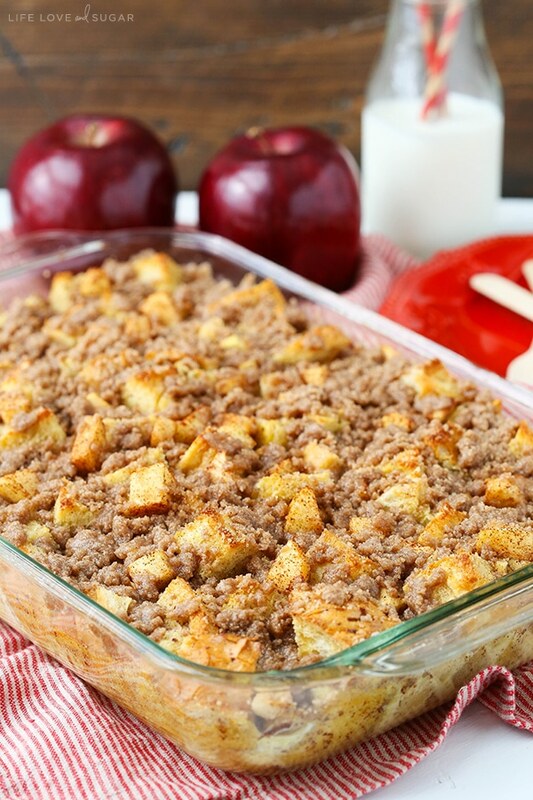 Add some chopped apples to the bread and add it to a casserole dish. The egg and milk mixture that’s poured over the bread is all mixed together in a big bowl. Easy, right? 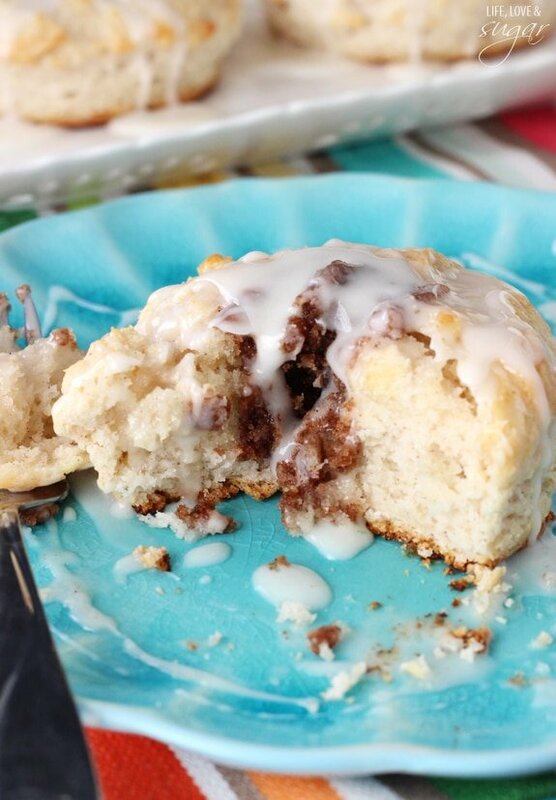 You’ll combine eggs, milk, cream, sugars and some flavorings. 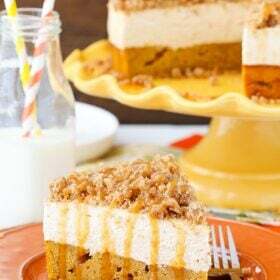 I like to use a mix of 2% milk and heavy cream to get some good fat in there and keep this casserole soft and moist. I also love using a mix of regular and brown sugars. The brown sugar adds some nice flavor to compliment the cinnamon and apples. For additional flavor, we’ve got some vanilla and cinnamon. I like to try to be sure when I pour the mixture over the bread that I get all the bread on top a little wet. It’ll moisten and soak up the liquid overnight, but that’ll help make sure that nothing gets too dry when it bakes later. 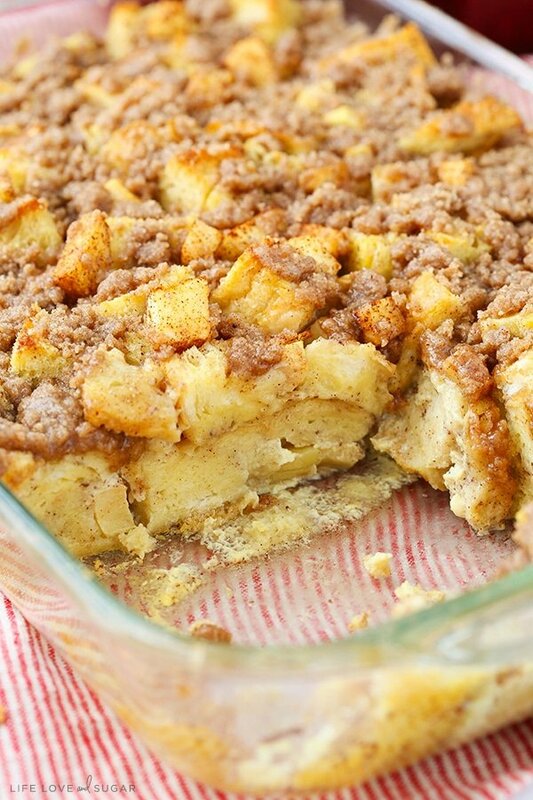 On top of the casserole is some cinnamon streusel – which is basically like magic when sprinkled over anything. The casserole should be baked for about 35-40 minutes. It’ll depend a bit on your preference – some people like a little moister center and some like it a little more cooked. One way to test the doneness is to stick a knife in the middle and see how much moisture comes out on it. 1. Grease a 9×13 inch casserole dish. 2. 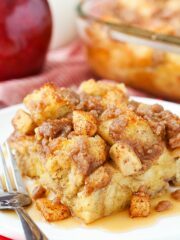 Combine the bread chunks and chopped apples and lay in an even layer in the bottom of the dish. 3. In a large bowl, whisk together the remaining ingredients, minus the streusel, and pour evenly over bread. Cover the casserole and store in the fridge overnight. 4. When ready to bake the casserole, preheat the oven to 350°F (176°C). 5. Bake the casserole for about 35-40 minutes. 6. While casserole bakes, in another bowl, combine the dry ingredients for the streusel. Add the butter and mash into the dry mixture until it forms a crumbly mixture. 7. 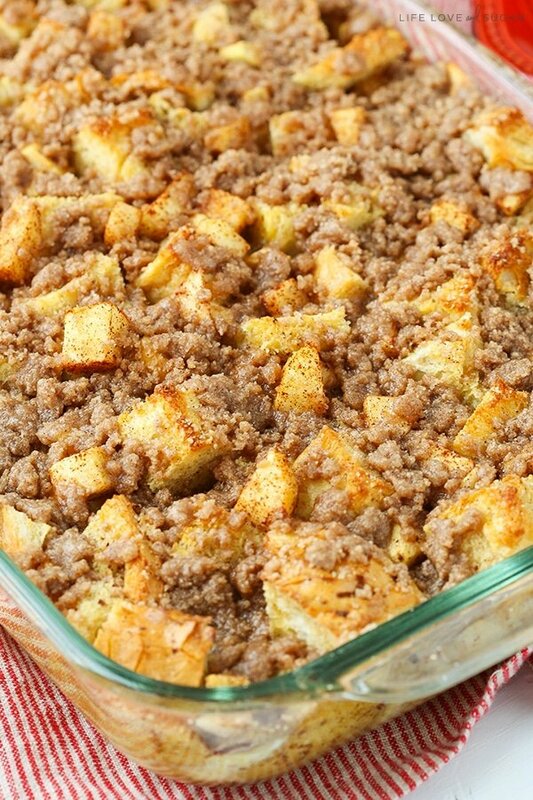 Remove the casserole from the oven and crumble the streusel over the top of the casserole. 8. Continue baking casserole for about 5 minutes, or until the streusel is melted over the top. 9. Serve the casserole warm with syrup. I’m a big Dorothy and Lisa fan too, but I’m not lucky enough to have a girls’ weekend with them. Hope you guys had a total blast! This looks amazing. 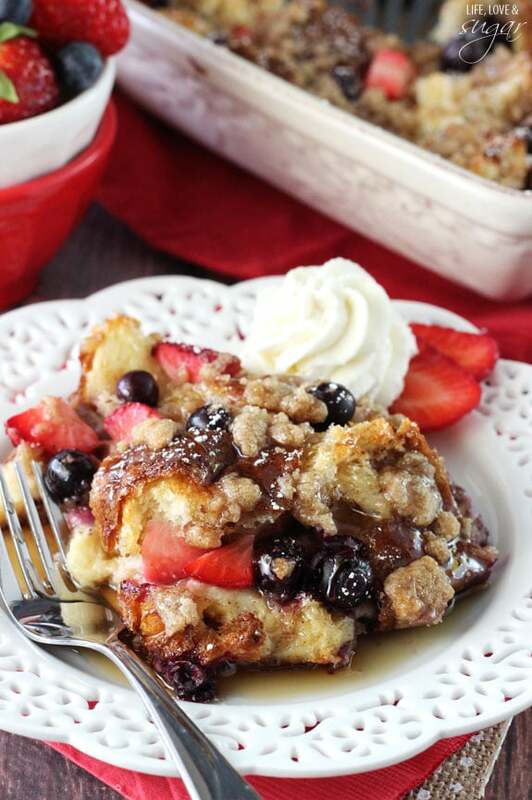 I love overnight French toast casseroles. So easy and so much better than standing over the stove and making French toast! I never tire of traditional French toast but i love mixing things up. This apple version looks so perfect for these cooler mornings! It’s on my schedule to make soon for my blog too. ???? 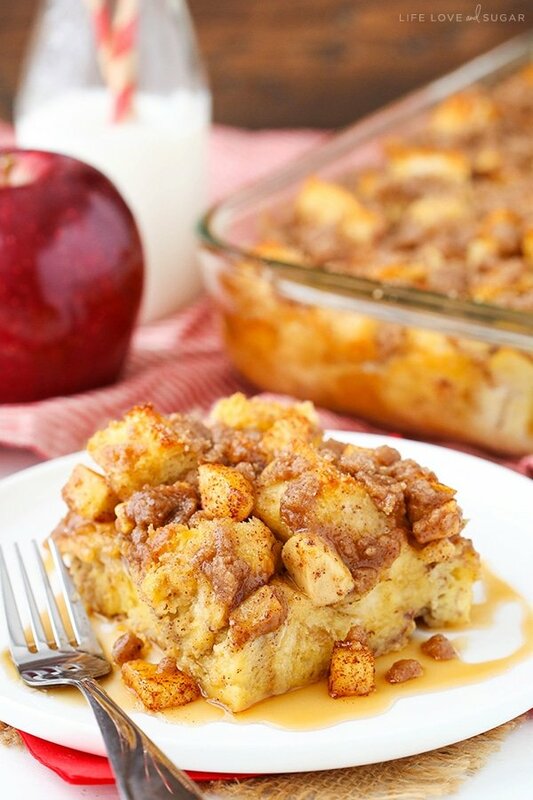 French toast bake is a favorite around here! 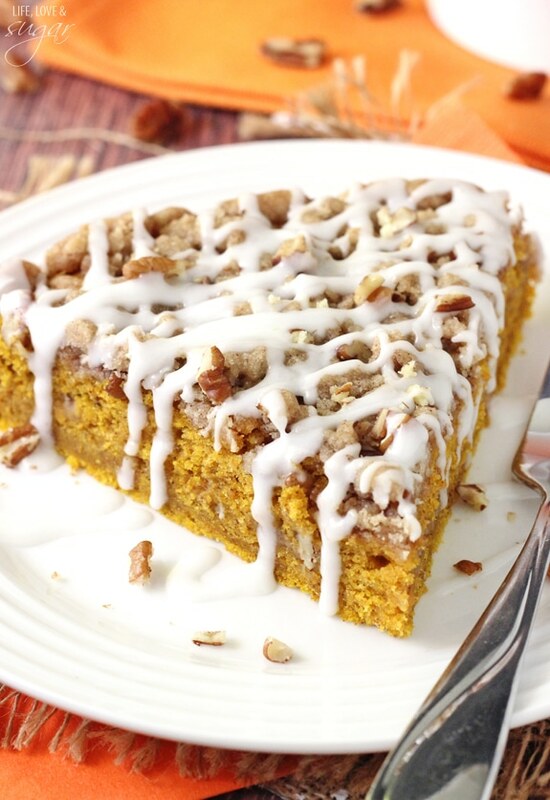 This looks like the perfect addition to a fall weekend brunch! Just ran into your blog via pinterest. This looks absolutely fabulous! Did you peel the apples first? What kind of apples did you use? You could do it either way – with or without peeled apples. I don’t think I peeled them. I used Red Delicious apples, but you could definitely use other varieties. I made this for a brunch party and it was a huge hit! I’m glad there are leftovers! I used macintosh apples and they had a honey flavor. Mmmm… I would definitely make this again! It seems like way too much bread and that ive only used half and the pan is full. Am i doing something wrong? I don’t know that you’re doing anything wrong. It can feel like a lot of bread. When you pour the egg mixture over it, it’ll condense a bit. 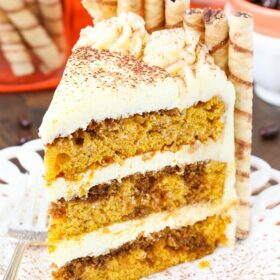 Can I make this on Wednesday afternoon and bake it Friday morning? Hmm great question. I’ve only ever let it sit overnight before. I’m not sure, but I think it’d probably be ok.
I’m going to make this casserole for Christmas morning and I’m going to try putting pecans on top. Should add a nice touch. Made a pan this morning for Thanksgiving and now it’s gone! Yum! THANKS LINDSAY! Do you have to use the sourdough or French loaf? I only have honey wheat loaf bread right now. I’d suggest one of those since they’re firmer and will hold up better. You could try the honey loaf though. I made this with a softer bread, it was delicious and custardy- very much like a bread pudding- and a big hit in my house! I think if using a softer loaf, cutting the bread and letting the cubes dry out for a few hours first would help. I use just honey wheat and it works just fine!! Did you keep it covered when baking it? No, I cook it uncovered. Made this for a work function and it was a huge hit. Do you think this would work with Almond milk instead of whole milk and heavy cream? Did you try it with the almond milk? How did it turn out? Also how much almond milk did you use? I’m dairy free right now so I couldn’t use the milk and cream. this for Christmas Brunch, it was tasty, but it wasn’t quite done. I will make it again but I will cook it for 55minutes. Hi there. Can I substitute the milk for almond milk or soy milk when making this recipe? I have someone in the family that cannot have cow milk due to allergies. Thanks. I would think it’d be ok. It could affect it a little, but probably not to much. What can I use instead of apple pie spice? I might try and google to get the right amounts, but it’s a combination of cinnamon, nutmeg, cardamom and all spice. You could also just use al intel cinnamon and nutmeg to keep it simple. Hello! Can we leave the casserole mixture in the fridge for some hours (2-3) instead of leaving for overnight? I’m not sure. I don’t know how the pastry would do. It’d probably be worth a try. Can you use canned apples? I haven’t tried it, but I don’t know why not. Hi Lindsay! Would I be able to make this 2 nights in advance? I haven’t ever tried it. Not sure if it’d get too soggy or not. Probably worth a try. Hi I was wondering what type of apples or combo of apples do you use? would granny smith be the only ones or could I use Jazz or honey crisp apples with out them turning into apple sauce? I used Red Delicious apples – I like their crispness. I haven’t tried the other varieties, but if they’re a softer apple I’m sure they’d taste fine, it’d just be a matter of crispness preference. Hi, I am going to make this casserole over the weekend. I noticed that you mention that the apple didn’t get too mushy. I absolutely cannot stand crunchy apples in baked things… Are they thoroughly cooked and soft? Or should I cook them for a bit ahead of time before I put them in a casserole so they are completely soft? It’s been a while since I’ve made it, so I’m not sure I remember the exact consistency of the apples. If you would prefer they be particularly soft, you could certainly cook them first. 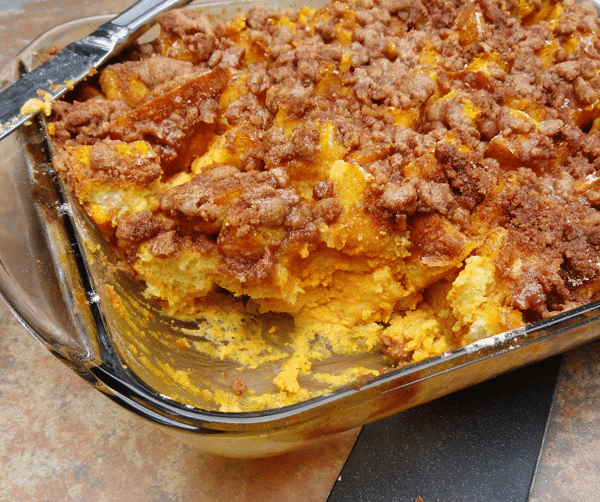 Have you ever tried adding cooked, crumbled and drained breakfast sausage to this casserole? The idea of sweet and savory sounds intriguing. I haven’t tried it, but I could be it possibly being good. I do love sweet and savory. How long can i keep this in the fridge after it is baked? I’d say 4-5 days is best. I don’t have any heavy cream just 2% milk…any suggestions? That would be fine for substituting. Have you tried making this in a crockpot? If so, how long would one cook it for? I am doubling the recipe, for about 12 people. How much longer do you think I should bake it? Thanks. Could you freeze the casserole before the streusal part? I haven’t ever tried it to know for sure. I might be ok.
What can I use to substitute the bread to make this gluten free? Perhaps gluten free bread? I’m not sure. Hi Lindsay, do you take the crust off the bread first? I bought some sourdough and the crust is on the harder side. Thanks! I don’t usually remove the crust. It softens overnight in the milk mixture. Do you think I could replace the eggs with applesauce and omit the apple chunks? I have an egg allergy but I need to try this! Thanks! I’m not super familiar with using egg replacements, but I think it’d be worth trying. Is it possible to put the streusel on it before it goes in the fridge overnight and just bake it covered with foil so it doesn’t get too brown? I need a casserole that someone (else) can just pop in the oven and not babysit or do extra work to. This looks SO good! Made too much for a breakfast with friends… baked only one dish, the other is still soaking.. do u think it would be ok to freeze the unbaked portion? I’m not sure that’d turn out so well. The freezing and thawing would probably affect the bread and make it a little sloppy. Hmmm, hard to say from a distance. Undercooked? Can I substitute half and half for the heavy whipping cream? Too much fat and calories in heavy whipping cream. I would use 2% milk instead of whole milk listed above. i am trying to find kid friendly breakfast recipes for the family. I made the recipe exactly as it was written, with two exceptions: instead of french bread, I used challah, and I used a combination of skim, 2% milk, and whipping cream. By doing so, I did have to bake the casserole longer, but it was definitely worth the effort. The streusel topping was sweet enough where the additional syrup was not needed at all. Thanks for sharing this recipe as well as the others you recommend. Sounds great – glad you enjoyed it! I am making this for Thanksgiving morning. Can’t wait as it sounds delicious. I had to make my own apple pie spice though. Hopefully it will still taste the same. Thank you for the recipe. I made this over fall break as the recipe started. It was a huge hit! I made it again this morning, let it sit all day and baked it for dinner. But this time I used bananas and wanted. It was so good, but if I make it this way again I’ll leave it or halve the amount of sugar in the eggs. Definitely a winner!! For those of you wondering about “soaking” over two nights instead of one. When I want to take some for an out-of-town trip I made the milk mixture on Thursday night and put it in a container. I then cut up all the French bread and put it in a baggie. When we arrived at our destination on Friday night I put it all together and put it in the refrigerator overnight and bake it up on Saturday morning. Never had an issue. I’ve done it with several overnight French toast recipes. Works like a charm! I cannot say enough how easy this was to make! I started it on Christmas Eve and then baked it Christmas morning, oh my goodness was it amazing! It looked like it would be too sweet but it definitely was not, it was perfect! Our family asked that we make this a tradition! It will be, hands down! Thank you for this! That’s so awesome to hear! I’m glad you enjoyed the casserole! We had this for Christmas brunch yesterday. It was delicious. Thank you for the recipe. We’ll be making it again. Delicious! 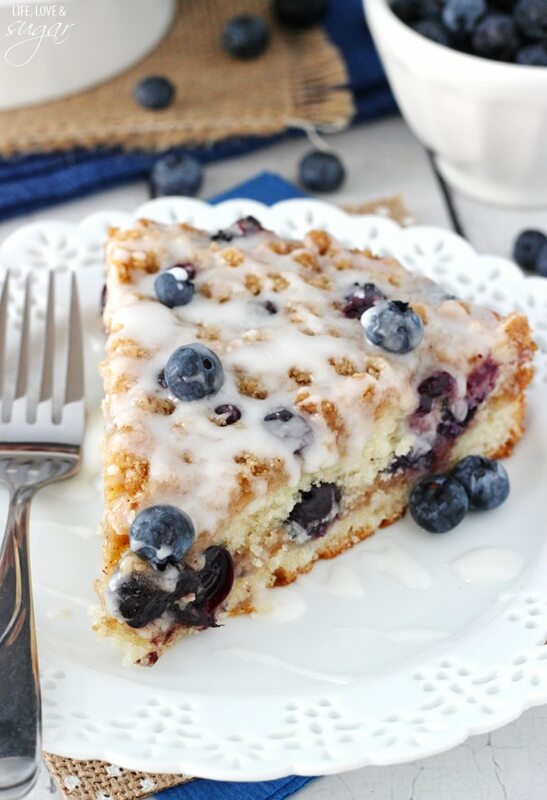 I’ve made this several times and it’s always a hit! Amazing recipe the kids gobbled it up!